You’ve probably heard about the decision by the U.S. Department of Health and Human Services to force religious employers who aren’t specifically in the Word-and-Sacrament business (hospitals, colleges, etc.) to provide insurance coverage for contraceptives, including abortifacients such as IUDs. Almost all of the outrage that has been expressed since has come from Roman Catholic leaders or from commentators such as Michael Gerson, Yuval Levin, and James Capretta (whose column is especially worth reading) who have focused almost exclusively on the impact the decision will have on Catholic institutions. But lots of other religious folks should be concerned, too. Specifically, the Departments seek to provide for a religious accommodation that respects the unique relationship between a house of worship and its employees in ministerial positions…. …[T]he amended regulations specify that, for purposes of this policy, a religious employer is one that: (1) Has the inculcation of religious values as its purpose; (2) primarily employs persons who share its religious tenets; (3) primarily serves persons who share its religious tenets; and (4) is a non-profit organization under section 6033(a)(1) and section 6033(a)(3)(A)(i) or (iii) of the Code. Section 6033(a)(3)(A)(i) and (iii) refer to churches, their integrated auxiliaries, and conventions or associations of churches, as well as to the exclusively religious activities of any religious order. For another, while those mainstream news outlets that have bothered to cover this issue have generally referred to the decision as covering “birth control,” at least some are in fact abortifacients. For instance, the “emergency contraception” drug Ella, approved by the Food and Drug Administration in 2010, acts to prevent implantation of a fertilized egg. Supporters say it doesn’t “terminate pregnancy,” because technically speaking “pregnancy” doesn’t begin under implantation. It does end a unique human life, however. Under this decision, religious organizations that object to abortion and believe the scientific evidence that a human life begins with conception will be forced to pay for such drugs. The Religious Coalition for Reproductive Choice (RCRC) celebrates the decision by HHS Secretary Kathleen Sebelius on January 20, 2012 to reaffirm the importance of contraceptive services as essential to the new health care plans and requiring that most religious employers comply with it. We recognize this is a victory for many women, but her decision not to extend this coverage to all Americans, no matter the religious perspective of their employer, is disappointing. All women deserve access to affordable birth control. The Sebelius decision permits some religious institutions to refuse to provide contraceptive services if they are devoted to worship and employ and serve people of the same faith. Other religiously-affiliated nonprofits and employers will be required to offer contraceptive coverage with no co-pays or deductibles. In her ruling, Sebelius finalized rules proposed on August 3, 2011. She also allowed some religiously-based institutions to have an additional year to comply with the ruling. The RCRC, you’ll remember, includes the Episcopal Church, UCC, PCUSA, and General Board of Church and Society and Women’s Division of the United Methodist Church. They apparently stand for the power of the government to force their fellow Christians to bow the knee to Caesar and deny their Lord. The Obama administration reached this decision after hearing from major medical societies, patient advocates, members of Congress, and, most importantly, regular Americans who disagreed with efforts to undermine the birth control benefit. Indeed, a small but vocal group of women’s health opponents launched a campaign to pressure the administration to exempt religiously affiliated universities, hospitals, social service agencies, and schools from the birth control benefit. The law already allows religious organizations like churches and church associations to deny birth control coverage for their employees–an exemption Planned Parenthood disagrees with. But that wasn’t enough for opponents of contraception…. Make no mistake about it: this is the camel’s nose under the tent, and it isn’t just a Catholic tent, either. Sooner or later, these and their fellow “reproductive rights” fanatics will be demanding insurance coverage for abortion from every employer in America, religious convictions be damned. I don’t know what to say except the arrogance is breath-taking. Obama doesn’t understand the point of government. The point of government is to run an orderly house in which a great many people may live together in relative harmony despite sharply disagreeing with each other on many things. A hotelier, if his goal is to just run a successful hotel, should not care very much if some rooms are rented by Jews, and some by Catholics, and some by atheists; and some by families, and some by pairs of cheatin’ spouses. Only if the hotelier puts his own moralism over the business would he attempt to force his guests to live by his specific rules of life. Obama is a moralist, and an arrogant one. For all the talk of Christians being rigid moralists, the dirty little secret is that the left is far more rigidly, arrogantly moralistic, and it is cheerleaded by our cultural institutions (media, academia) rather than pushed back against, so its arrogance is encouraged. Obama is pushing, very hard, a rigid moral system, and attempting to “shove it down the throats” of people who do not seek nor need his moral instruction. It just happens to be that his code of morality is an unconventional one, borne not in the first century but in the twentieth, and which, when taken to extremes, has included conceptions of sexuality which are essentially Satanic in their license. Can he make a little space for those who do not rush to embrace his Madonna Moralism? No. For to do so would be to confess doubt about the Moral Scheme he has in mind for people; it would signal that he’s not utterly certain of his own moral beliefs. And few on the political left have any sense of modesty about any of their culture-changing schemes. They are so right that of course the coercive power of the state — with its machinery of stripping away the property and liberty of those who run afoul of it — should be deployed to wipe out mendicants and heretics. One of the most cherished rights, never expressed anywhere but truly central to any truly free society, is the right to be Wrong. By which I mean, you should not just be free to do the things which the hegemonic culture deems to be “right.” No one ever tries to outlaw that which they themselves believe to be right. What they attempt to do, of course, is outlaw that which they believe to be wrong. If you do not respect a citizen’s right to be wrong — if your first impulse is to use the frightening machinery of state coercion to compel him to be “right,” as you see “right” — then you do not respect him at all. This is the chief character flaw of the leftist movement — their inability to respect anyone at all but their own. A very provincial and solipisitically childish way to view the world, of course, which leads to a vicious arrogance in attempting to pound, pound, pound square pegs into the round holes the state has cut for them. The left would just be wrong, and not dangerous, if it weren’t so arrogant about disposing of people’s freedom with a single thoughtless line of legislation. How does Robert Reich, former Bill Clinton cabinet member, and noted public policy analyst, respond to this pairing of Gingrich and [contributor Sheldon] Adelson? He claims not to know what lies behind the Adelson support for Gingrich. —James Wall, who is either 1) asserting that the Treasury prints two kinds of money, Jewish and Gentile; 2) contending that Adelson makes campaign contributions in shekels rather than dollars; or 3) using an old anti-Semitic trope to make a perfectly legal campaign contribution sound sinister–you be the judge. John Tyler was born in 1790. He became the 10th president of the United States in 1841 after William Henry Harrison died in office. Tyler fathered Lyon Gardiner Tyler in 1853, at age 63. Then, at the age of 71, Lyon Gardiner Tyler fathered Lyon Gardiner Tyler Jr. in 1924 and four years later at age 75, Harrison Ruffin Tyler. Both men are still alive today. Think about that: John Tyler was born less than ten years after the end of the Revolutionary War, less than three years after the ratification of the Constitution, less than a year ater the inauguration of George Washington as our first president. That man has living grandsons, one of whom is only seven years younger than Ron Paul, who is running for president today. Incredible. Newt Gingrich is the current holder of the Republican crown. Saturday night, NBC projected Gingrich as the winner in the South Carolina Republican primary over his closet rival, Mitt Romney. The race for an opponent to run against incumbent President Barack Obama is down to two candidates, a former House Speaker, and a former Governor. The early South Carolina primary was pivotal for Gingrich and a major setback for Romney. After losing in Iowa and New Hampshire, Gingrich appeared on his way out of politics. He was a distant second in polls the week before the South Carolina voting. Republican big money was lining up behind Romney. Money dried up for Gingrich. It certainly did not help that he is a candidate who carries some of the heaviest political baggage this country has seen in these quadrennial shifts in American political power, three wives, admitted infidelities, two divorces, and an ethics charge that led to disciplinary action during his time as House speaker. Gingrich was not giving up. He turned for help from one of the richest men in America, Sheldon Adelson, a billionaire casino owner and Mr. Gingrich’s longtime friend and patron. The two men share a politically conservative ideology and a deep loyalty to Israel. And for the Israel-fixated Wall, who thinks that the “Israel lobby” (read: Jooooooos) run America, that’s all that really matters. Mr. Adelson was building his newest resort casino, the Venetian, and became embroiled in a battle with a local culinary union trying to organize his employees. The conflict soured further when Adelson helped finance a campaign in Nevada to pass legislation curtailing the ability of labor unions to automatically deduct money from members to finance political activities. Gingrich helped Adelson’s team develop an anti-union pitch in support of the Nevada legislation. Gingrich supported the legislation and was honored with a Nevada fund raiser. Gingrich and Adelson became fortuitous pals out of this initial anti-union campaign. “Both men have long been staunch American allies of Prime Minister Benjamin Netanyahu of Israel. Mr. Adelson owns a free daily newspaper in Israel [Israel Hayom] that is credited with helping Mr. Netanyahu return to power in 2009. After Obama’s election, the bond that centered on Israel grew deeper. In an interview he gave in December, 2011, Gingrich declared “that Palestinians are an “invented” people — meaning they had no historical claim to have their own state and that they remain committed to destroying Israel. Adelson is the money man; Gingrich the political leader. Together, once they get past Mitt Romney, they plan to confront Barack Obama in November about his failure to provide Israel 100% support. The South Carolina primary was his last chance. Fortunately for him, Adelson’s PAC money, and a majority of South Carolina Republican voters combined to hand the former Speaker a significant victory. Leave aside the fact that virtually all observers have credited Gingrich’s debate performances over the last week before the voting for his victory. Instead, note that Mitt Romney and his supporting super PAC outspent Gingrich and his by more than 2-1. That Jewish money is magic, my friends. Gingrich has once again proven that he is a politician who is smart, tough and attuned to the conservative political pulse, especially in a state like South Carolina, where loyalty to Israel has become a conservative Protestant White Christian biblical belief. Voters, who once could not find Israel on a world map, have found Israel in their Bibles. This is not a group that will embrace Barack Obama’s reelection. They will go with whatever candidate the Republican Party hands them. Gingrich is, at the moment, that candidate. Of course, no screed about the power of the Joooooos would be complete without some snide cracks about their willing stooges, the Christian Right. The fact that exit poll information indicated that voters primary concerns were about jobs, the economy, the federal debt, government spending, and defeating Barack Obama in November. If white evangelicals are involved, they must have voted the way they did because of Israel. Israel supporters form narrow, but strategically located voter blocs, dependable, to be sure, though not yet a national majority. But Gingrich is adaptable and shifty in a political fight. His next primary comes in Florida, January 31, where two dependable voter blocs should help him repeat the South Carolina pattern, once again overlooking his past sins and embracing his devotion to Israel and political conservatism. The two voting groups in Florida are ethnic Jewish voters who live in the southern part of the state, and conservative biblical literalist Protestant White Christians in the middle and northern sections of the state. And here’s where it’s clear that what’s operating in Wall’s paranoid fantasy is not merely anti-Israelism, but anti-Semitism. See, those “ethnic Jewish voters” who live in South Florida, who can be counted upon to “embrace his devotion to Israel,” are overwhelmingly Democrats, and Florida has a closed primary. Even in the general election, most Jews (my guess would be 75% or more) would no more vote for Newt Gingrich than they would try to make latkes out of pig’s feet. But in Wall’s world, Jews are not overwhelmingly reliable Democratic voters, they are Mossad robots who will automatically vote for whoever the Jewish money men tell them to vote for. This is what happens when an anti-Semite tries his hand at political analysis: it becomes all about the Jooooooos. And yes, the IMPN has already linked to it. 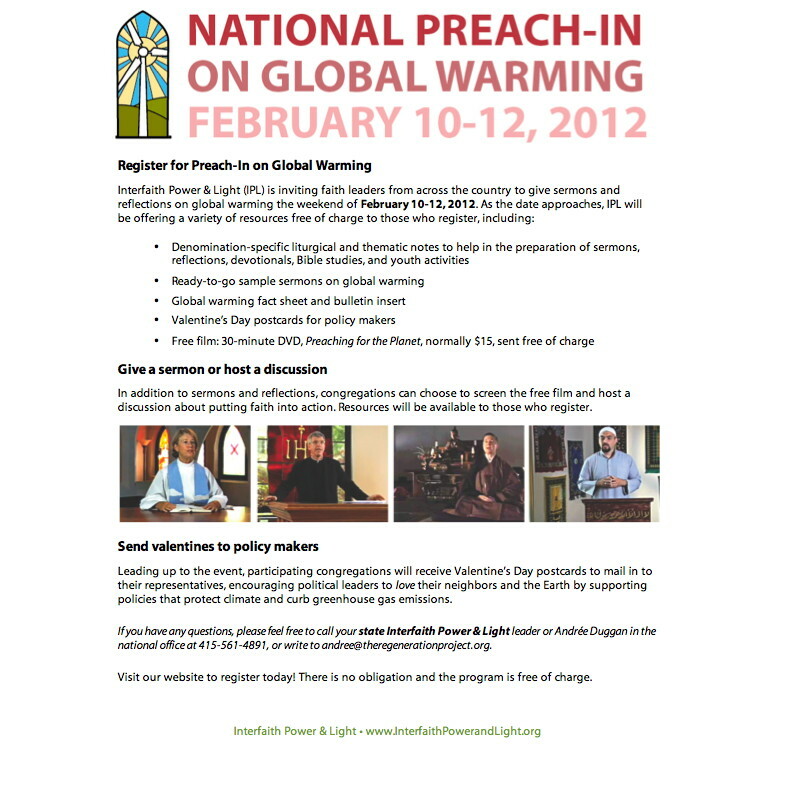 Interfaith Power and Light is hosting a national preach-in on global warming on Sunday February 12th. Planned to communicate a love for, and dedication to, God’s creation as Valentine’s Day approaches, this preach-in invites people of all religions to consider preaching, teaching, praying, and otherwise bringing awareness about climate change. I will not be registering for this august event, so I won’t get any of the fact-free downloadable resources, or any of the “sample sermons” that I could pass off as my own use as models for my own. 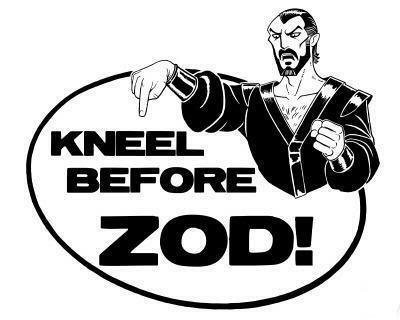 But then, I also won’t be promoting a new religion in my pulpit on February 12, either.